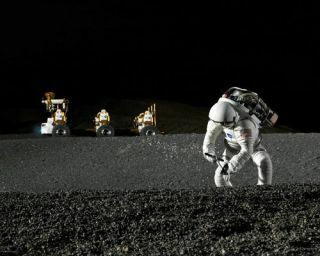 Spacesuit engineer Dustin Gohmert simulates work in a crater of Johnson Space Center's Lunar Yard, while his ride, NASA's new lunar truck prototype, stands ready in the background. The rover has the ability to lower itself all the way to the ground, making climbing on and off easy -- even in a bulky spacesuit. The discovery of water on the moon announced this week couldmake our celestial neighbor a more attractive candidate for a future mannedmission. Plans to send American astronauts back to the moon are inlimbo right now, while the Obama administration weighs whether or not to carryon with NASA's goal of reaching the moon by 2020. Now some scientists say thenew finding of widespread water, in trace amounts, on the lunar surfacecould spur moon hopes. "This makes the moon a more attractive destination togo to," said University of Colorado astrophysicist Jack Burns, chair of thescience committee for the NASA Advisory Council. "It's a game-changerin the sense of future human exploration to the moon, in that now there is thepotential of resources of water that future astronauts could tap so that wedon?t have to bring this water from Earth." Scientists announced the water discovery Wednesday and thedetails are outlined in the Sept. 25 issue of the journal Science. Threeindependent spacecraft identified the signature of water molecules spreadacross the lunar surface. Though many experts have believed the moon's poles tocontain deposits of water ice, most scientists were surprised to hear of themore widespread finding. "The moon certainly becomes a more interesting place togo," said John Logsdon, director of the Space Policy Institute at GeorgeWashington University. "If you're going to any distant destination, it'smuch better the more you can live off of local resources and one of the mostcrucial resources is water. It's an important step towards the sustainabilityof a lunar outpost." But Logsdon cautioned that the discovery of trace amounts ofwater in the top layer of lunar dirt doesn't necessarily mean it is abundant,or easy to obtain for drinking and other human purposes. "People have to take a deep breath and say, 'All right,how is this water embedded on the moon, and how hard is it going to be toextract it for use?'" he said. "As far as I can tell, these findingsdon?t answer that question." Experts seem to agree that more data on the moon's waterresources is needed before NASA can pack off astronauts to the moon and plan touse the water that's there. "It's a very good question about what it takes toactually do this on the moon," Burns told SPACE.com. "It would dependon how far below the surface it is, how concentrated it is. The little bitthat?s there that is being seen in really trace amounts. Taking that and turningit into a substantial supply of drinking water would be pretty tough." However, some scientists think the small quantities of waterthat have been confirmed so far might be just a hint of the moon's total waterwealth. "We see traces now, but imagine that there are polarregions that trap the water in," said geochemist Alberto Saal of BrownUniversity in Rhode Island. "It could be a significant source." Researchers think the moon might be hiding most of its waterat the poles, which contain permanently shadowed craters that are cold enoughthat water would be less likely to evaporate away. Other scientists echoed this hope: "The fact thatthere's that much water in the upper layers of the moon is exciting because itleads to the possibility of significantly larger amounts of water in theshadowed craters," Burns said. A source of water on the moon would be useful to futuremissions in a variety of ways. Besides drinking and everyday use, watermolecules could potentially be broken up into their constituent hydrogenand oxygen atoms, which are two major sources of rocket fuel. If a spaceship needed only pack enough fuel for the way out, it would save preciousweight for carrying other cargo. Then, once on the moon, astronauts couldextract the resources directly from the moon to create enough fuel to fly home. This is likely to be difficult, but not impossible. Samegoes for extracting drinking water from trace amounts of water in moon dirt. "That's an engineering challenge, and we're good atthose," said John Olson, director of NASA's Exploration Systems MissionDirectorate Integration Office. "We're all about engineering challenges.Small concentrations are something we can work." Besides making trips to the moon potentially easier, thewater discovery makes the moon appealing as a training ground for future tripsto Mars. "The case has been made for a few years that the moonis a good analoguefor Mars," Burns said. "If it really does have water, it becomesan excellent analogue for Mars, and a practical next destination to reallylearn how to live and work on an alien hostile destination." Since Mars is thought to have stores of water, both in theatmosphere and in the form of ice on the surface, a water-bearing moon is abetter simulation of what astronauts are likely to find on Mars. Sendingastronauts to the moon could provide a good learning opportunity, and a testingground to learn how to extract water for human use - an important skill to havewhen it's time to go to Mars. And because it only takes three days to get to the moon,compared to about a year to get to Mars, a preliminary trip to our ownsatellite is a practical first step, some say. "I think that it is important because now you can put along-term base on the moon that will help probably to think about the next jumpthat is going to Mars," Saal said. Pursuing a base on the moon is not just useful for futureplanetary missions, but also as a way to better learn how to live on Earth. "It's really about developing our capability to live offthe land and enhance our expertise in sustainability," Olson said.